In the euphoria of the ‘New Malaysia’ brought forth by the ousting of Barisan Nasional (BN), then Opposition Coalition led by Tun Dr. Mahathir Mohamad resumed power and control but with the most ‘uneasy’ partners. Ilham Centre director Hisomuddin Bakar says the power struggle among PH parties has become apparent. PETALING JAYA: A think tank has observed that the parties in Pakatan Harapan (PH) have yet to show they can work together as a team. Speaking to FMT, Ilham Centre director Mohamad Hisomuddin Bakar said the power struggle among component parties had become apparent. “PH may have won several states from Barisan Nasional (BN), but the components have yet to achieve a sense of understanding as parties in a coalition,” he said. “They may have achieved their goal of taking over the government, but they were not ready for a win this big or, rather, they are now wearing an oversized shirt, as the Malay saying goes. He said the coalition, in order to meet its challenges, must first acknowledge that it had not won the May 9 election based on its strength. Hisomuddin said PH would find it hard to bring reforms to states remaining under BN unless the coalition was strengthened. He said the coalitions’s defeat in Perlis and Pahang reflected the weakness of its presence in both states. He cited the problems in deciding on the menteris besar for Kedah and Johor as further evidence of a lack of teamwork in PH. “For Kedah, PPBM was taking the lead in GE14. By right, the understanding should be that it will take the MB’s post, but there was interference from PKR,” he said. It is abundantly clear about the inability of the four parties which formed the coalition that was invited to form the Federal Government by His Majesty Seri Paduka Yang DiPertuan Agong XV, to work together. A clear example is the announcement of the Cabinet. It was done in three different stages. The first one was Tun Dr. Mahathir Mohamad as the Prime Minister and all the four party top leaders as Cabinet Ministers which is om 12 May 2017. Then the second one, where were only nine names announced. Even after the Cabinet was sworn in on Monday 20 May 2018, two very strategic posts namely Ministers for Foreign Affairs and International Trade and Industry were omitted. It is expected there would be a third round of announcement and swearing in ceremony as Istana Negara. In the past thirteen post GE, none of the BN Chairmen had ever needed this long and stages to announce and gotten the Cabinet sworn in before His Majesties. It is because the understanding between UMNO, as the lead and mainstay of BN and component parties and honouring the understanding and respect. Even when certain BN component parties like MCA did quite badly, then the said BN Chairman would ensure the agreed number of representation of the party and the Malaysian Chinese they front, are appointed to the Cabinet. What is very peculiar is that a Council of Eminent Persons was announced ahead of the mainstay of the Cabinet of Fourteen, which the same day that all Pakatan Harapan leaders were nominated for their respective Cabinet posts. Adding to the oddity, the CEP had started working and summoned many key personalities and even announced an Institutional Reform Council, way ahead even the Cabinet Minister reported for duty. KUALA LUMPUR: The newly set up Institutional Reforms Committee (IRC) says it has been tasked with examining the present state of key institutions and laws and recommending necessary reforms to ensure these institutions are not subverted for extraneous ends. To this end, the panel said it would consult extensively with all stakeholders and invite their active participation, reported Bernama. “We will then present the recommendations to the Government through the Council (Team of Eminent Persons) with a view to reinstating the integrity of the institutions and promoting and enhancing the rule of law,” the committee said in a statement last night. The formation of the five-member committee was announced by the Team of Eminent Persons in a statement earlier yesterday. Working together: The IRC panel comprises (from left) Vohrah, Mah, Mohd Arshad, Dr Shad and Ambiga. “These shortcomings in the system need to be identified and addressed. “It has also become imperative to appoint persons of unquestionable integrity to lead these institutions,” it said. Chaired by retired judge of the Court of Appeal Datuk K.C. Vohrah, the other members of the committee comprise retired Court of Appeal judge and Suhakam commissioner Datuk Mah Weng Kwai; National Patriots Association president Brig-Jen (Rtd) Datuk Mohamed Arshad Raji; Tunku Abdul Rahman Professor of Law at Universiti Malaya Emeritus Prof Datuk Dr Shad Saleem Faruqi and National Human Rights Society (Hakam) president Datuk Ambiga Sreenevasan. The statement pointed out that the rule of law was the basis upon which Malaysia as a democracy was founded. “The rule of law is about accountability, just laws, transparency, open government, institutional independence, an independent judiciary, and checks and balances,” it said. Meanwhile, the Government’s Team of Eminent Persons formed the IRC to help bring about “positive change” in the country. The committee will report to the Team of Eminent Persons, which will then present the report to Prime Minister Tun Dr Mahathir Mohamad. In a statement yesterday, the Team of Eminent Persons said that while it was set up to advise the Government on economic and financial matters, economic reform on its own could not bring about the desired change unless accompanied by institutional reforms. The Team of Eminent Persons, which is led by former Finance Minister Tun Daim Zainuddin, consists of ex-Bank Negara governor Tan Sri Dr Zeti Akhtar Aziz, former Petronas president Tan Sri Hassan Marican, Hong Kong-based tycoon Robert Kuok and economist Prof Dr Jomo Kwame Sundaram. It is doubt that this unorthodox manner of getting things done would actually provide productivity to the Federal Government machinery in the short and medium term. What more, to get the agreement of all the political parties which formed the Federal Government and most State Governments, especially the aspirations and hopes of their own members are not quite in tandem and complimentary to each other. Centre to Combat Corruption and Cronyism (C4 Centre) activist Cynthia Gabriel urged that the case on DAP Secretary General Lim Guan Eng be given a priority attention. 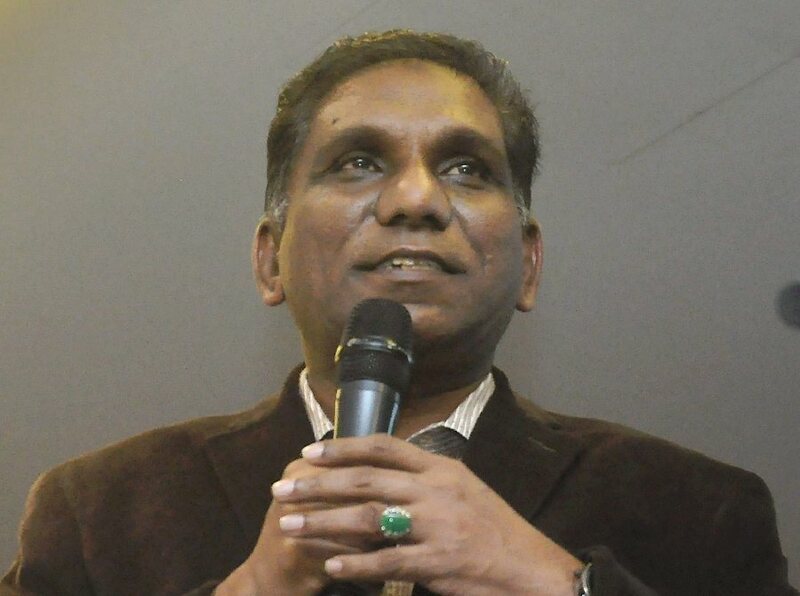 KUALA LUMPUR (May 22): The Centre to Combat Corruption and Cronyism (C4 Centre) has urged for the Attorney General’s office to prioritise the corruption charge of the newly-appointed Minister of Finance, in order to uphold good governance. In a statement, the centre today said it is troubled that Lim Guan Eng has been appointed as Finance Minister, despite earlier statements by Prime Minister Tun Dr Mahathir that he can only be appointed if he has been cleared of his corruption charge. “We acknowledge that there is no legal compulsion that prevents Lim’s appointment as minister, while still answering for a corruption charge. However, there are good governance principles that underlie the importance of Tun Dr Mahathir’s earlier statement. “Public officials must uphold full accountability for their actions, and corruption must be completely absent — how can this be neglected with the newly-minted cabinet and especially [with] the leadership of the finance ministry at stake?” said C4 executive director Cynthia Gabriel. Gabriel said while swiftness is required to implement the Pakatan Harapan (PH) government’s promises to the people and its 100-day policy goals, the government should also walk the talk on systemic reforms. “Therefore, the rule of law and due process in clearing Lim Guan Eng must uncompromisingly be followed, before any federal appointments,” she added. Additionally, C4 also urged for greater transparency on the process between the prime minister and the attorney general’s office to instill confidence in the public sphere that no strings were pulled, demonstrating due process was adhered to, despite the urgency. “We trust that the PH government is vigilant and must not falter at this pivotal moment in Malaysian history. Precedent must be set for future generations, such that reform truly takes root in Malaysia,” the centre said. It is rather odd that Gabriel inaugural statement post appointment of the Special Task Force reactivated to investigate the so called 1MDB scandals, is not anything related to the strategic investment company which is now under the Ministry of Finance (MOF) Inc. The fact Attorney General Tan Srì Apandi Mohamed Ali was asked to go on leave last Monday by Prime Minister Tun Dr. Mahathir Mohamad, had arisen suspicion by many. AG Apandi in the capacity of Public Prosecutor who charged Lim, then Chief Minister of Penang for corrupt practices, in June 2016. Prime Minister Dr. Mahathir also reactivated the Task-Force to investigate on 1MDB matters, headed by Tan Srì Abu Talib Othman and members comprised of former AG Tan Srì Abdul Gani Patail, former MACC Chief Commissioner Tan Sri Abu Kassim Mohamed, newly appointed MACC Chief Commissioner Dato’ Seri Shukri and Gabriel herself. In reference to PP Vs Lim Guan Eng, Gabriel as the so called graft-watch-dog should be mindful that so far, no new evidence has been tendered in consideration of the prosecution’s case. Therefore, there is neither reason for AG Apandi nor the Solicitor General currently acting as his behalf should review the case but to allow the case to continue on its normal cause without any interference. In one of his daily media conference, Prime Minister Dr. Mahathir promised the “Separation of powers”, hence the Public Prosecutor should be allowed to do their duty and the bench be given the independence to hear the case, in the name of justice. When Prime Minister Dr. Mahathir announced his first top five of his Cabinet days after his Pakatan Harapan were declared winners of the XIV GE, DAP Secretary General Kim Guan Eng was named the Minister of Finance. Then days later after being highlighted by many including the netizens, Prime Minister Dr. Mahathir said “Lim Guan Eng got to clear his name first”. Yet, yesterday he swore in before His majesty Seri Paduka Yang DiPertuan Agong as the Minister of Finance as his corrupt parctices case is still ongoing. This is also what Gabriel highlighted. PETALING JAYA: Lim Guan Eng must be cleared of any corruption charges before becoming the Finance Minister, said the Centre to Combat Corruption and Cronyism (C4). Lim is currently facing charges of using his position as the former Penang chief minister to obtain a plot of land and a bungalow at below market value. He was also charged with gaining gratification for himself and his wife Betty Chew Gek Cheng by approving the application for conversion of agricultural land to a public housing zone in Balik Pulau to a company. Despite his ongoing trial, Lim was sworn in as the new Finance Minister on Monday (May 21). “While there is no question about Lim Guan Eng’s suitability for the candidacy, it raises questions about how the Pakatan Harapan is pushing his appointment through,” said Gabriel. “Public officials must uphold full accountability for their actions, and corruption must be completely absent – how can this be neglected with the newly minted Cabinet and especially the leadership of the Finance Ministry at stake,” she added. She said the Pakatan government needed to “walk their talk” of systemic reform, adding that the country needs clean and honest leaders. Gabriel added that the rule of law and due process in clearing Lim must be followed uncompromisingly before any federal appointments. She said that as such, the Attorney-General’s (AG) office has to treat Lim’s case with the greatest urgency and the highest priority. “We urge greater transparency about the process between the Prime Minister and the A-G’s office to instil confidence in the public sphere that no strings were pulled, demonstrating that due process was adhered to despite the urgency,” she said. Gabriel acknowledged that there were no legal implications that prevented Lim from taking up the role. She, however, noted that there are good governance principles which underlay the importance of Dr Mahathir’s statement. Prime Minister Dr. Mahathir already ‘Flip-Flop’ped on several items pertaining to his Cabinet and other strategic appointments last week. The omision of the appointment of Ministers of Foreign Affairs and Imternational Trade and Industry are worrying analysts. The retired MACC Deputy Chief Commisioner Dato’ Shukri Abdul came back after Tan Sri Zulkefli quit, and begins his new term with a drama from the past. Shukri finally retired in August 2016 at the age of 56. During his farewell speech, he hit out at an “individual” who had alleged that he was involved in a conspiracy to topple Najib and his administration. Never mind all the showboating before. All the dramas, manipulations, slanders and lies, which were the basis of Malaysians’ thought and decision when they went to the polls on 9 May. Prime Minister Dr. Mahathir and his Motley Crew, have in exactly two weeks demonstrated that they are inconsistent and drama is the best that they have to sell, instead of a bankable plan. Prime Minister Tun Dr. Mahathir Mohamad ‘Flip-Flop’ed on his own words about DAP Secretary General “Lim Guan Eng has got to clear his name first” as the latter swore in before His Majesty SPB YDP Agong as the Minister of Finance. This statement the Prime Minister made is definitely the opposite of what happened in Istana Negara a few minutes ago. Lim currently under going trial in Penang for a corrupt practices crime and under active investigation by MACC for another case. It is obvious that Prime Minister Dr Mahathir isn’t consistent about what he plans to do. Earlier, he announced that he would also sit in the Cabinet portfolio for Education. PETALING JAYA: Prime Minister Tun Dr Mahathir Mohamad will take on a second Cabinet portfolio as Education Minister. Meanwhile, Deputy Prime Minister Datuk Seri Dr Wan Azizah Wan Ismail will serve as Women’s Affairs and Welfare Minister. “I took over the education portfolio because I think so many people are uneducated in this country,” he said, tongue-in-cheek, at a press conference yesterday after a Paka­tan Harapan presidential council meeting. He said Malaysia’s way of teaching is “outdated” and hoped more Malaysians will be computer-savvy. “We should devise new ways of teaching,” said Dr Mahathir, adding that he will introduce an online system to teach students in schools. He added that there will only be one ministry in charge of all matters regarding education, unlike the previous administration which had a Higher Education Ministry on top of the Education Ministry. Dr Mahathir’s ministerial post was seen by some as contrary to a promise in Pakatan Harapan’s manifesto that says the Prime Minister should not hold any other positions, especially Finance Minister. When asked what role newly-released Datuk Seri Anwar Ibrahim would hold in the Pakatan government, Dr Mahathir said Anwar would be in the “top six” in the presidential council. It was explained that the council will consist of six top leaders. “The top six meet when there are problems or important decisions to make,” said Dr Mahathir, adding the council will meet every month. 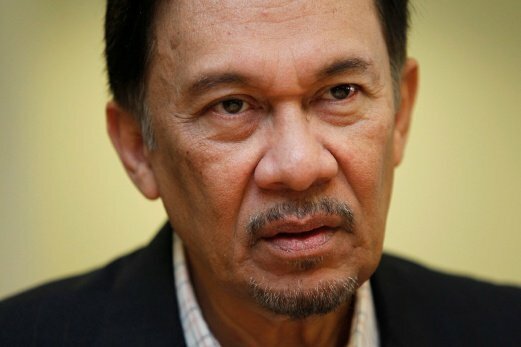 Anwar had earlier said he will not make an immediate return to politics, and plans to give a series of talks overseas. Asked why there was a delay in naming the Cabinet, Dr Mahathir said there were four parties in the coalition, each with their demands and he had to ensure each candidate is suitable. “We will announce it tomorrow (Friday) if I can do things in time. If not, I have to delay it,” he said. Dr Mahathir had announced three ministerial positions filled by Pakatan’s top leadership. Parti Pribumi Bersatu Malaysia president Tan Sri Muhyiddin Yassin will be Home Minister, while DAP secretary-general Lim Guan Eng will helm the Finance Ministry and Parti Amanah Negara president Mohamad Sabu is Defence Minister. Dr Mahathir said he aims to get all the ministers sworn in by Monday. He also announced the setting up of a special task force to safeguard the interests of the Indian community, women, youth and orang asli. Its aim is to give attention to minority groups, with the Indian community being the priority. Dr Mahathir also said Opposition leaders who were in the previous government cannot be accepted by any Pakatan Harapan parties. He said parties like Umno are facing “migration problems” with many members leaving. “We have also set a principle that will be enforced now, that any members of the Opposition have to become Independents first and then declare their support for the Pakatan government. “Those formerly part of the government cannot join Pakatan or its parties. This is our decision as of now but we might revise it in the future,” he said. On 1Malaysia People’s Aid (BR1M) handouts, Dr Mahathir maintained that the Government will continue with the financial aid but will take another look at who gets it. “BR1M is not to be seen as rasuah (bribery) or corrupting the people into supporting the Government. “It should be regarded as a way of mitigating social problems,” he said. He ‘Flip-Flop’ped and later announced that MP for Simpang Rengam Dr Maszlee Malik would instead assume the post for the Ministry with the most employee, when highlighted that in the Pakatan Harapan Manifesto, the Prime Minister is not supposed to sit in any Cabinet post. PETALING JAYA: Prime Minister Tun Dr Mahathir Mohamad has stepped back from his intention to become the new Education Minister today, to abide by the Pakatan Harapan (PH) manifesto. In the list of Cabinet Ministers released today, the new Education Minister is International Islamic University Malaysia (IIUM) lecturer and terrorism researcher Dr Maszlee Malik. Maszlee Malik, the Simpang Renggam MP, joined Pribumi in March, and sold gold and silver political memorabilia to help fund his election campaign. The inconsistencies are good reflection that neither Prime Minister Dr. Mahathir nor Pakatan Harapan thought through in totality what they were supposed to do and roles and functions they were supposed to fill. The fact is that the Cabinet took so long to be announced and properly sworn in before His Majesty Seri Paduka Baginda Yang DiPertuan Agong is also evidence they neither expect to get the results they achieved at XIV GE nor form a Federal Government. Strategic Cabinet Ministerial posts such as Foreign and Internationally Trade and Industry, which are very important ministries considering that global trade and relationship is the nation’s lifeline, are not included. Yet, the Council of Eminent Persons was the first to be announced and already met six times. An important fact to consider that Prime Minister Dr. Mahathir had only the experience to work with PPBM Tan Sri Muhyiddin Mohd. Yassin in an administration. The former had never worked with Wan Azizah, Lim Guan Eng, Mohamad Sabu, Gobind Singh Deo, M Kulasegaran, Salahuddin Ayub, Dr. Zulkefly Ahmad, Rina Harun, Dr. Maszlee Malik nor Dato’ Seri Azmin Mohamed Ali. Now that they managed to oust the Barisan Nasional (BN) Government, it is very dodgy for them to deliver their promises, as well provide the stewardship for the Federal Government machinery for steam ahead even at the rate and progress the previous administration did. Imagine a ninety plus year old Captain who has retired the past fifteen years and only had the experience with one out of fourteen senior officers, to steward a large ship carrying valuable cargo through rough seas at the same vector, racing against time. Malaysians should realise that all these are indications that the Federal Government, resources and the course of the nation would not progress on the same vector that it had before. 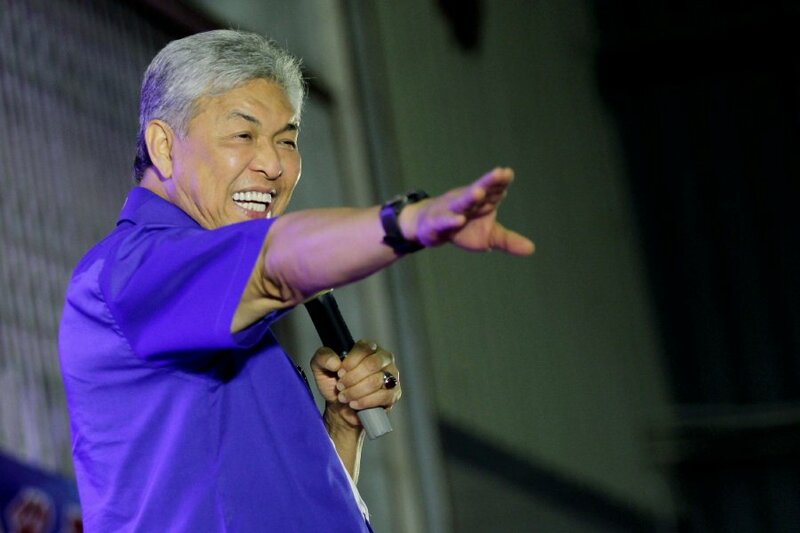 Acting UMNO President Dato’ Seri Dr. Ahmad Zahid Hamidi urges UMNO and Barisan Nasional (BN) party leaders and members to ‘Bite the Bullet’, face reality and move on, to carry on the struggle for the sake of the people and nation. KUALA LUMPUR: Datuk Seri Dr Ahmad Zahid Hamidi today called on Umno members to continue giving their support to the party’s leadership, including other Barisan Nasional component parties to ensure survival. Zahid, who is now carrying out the duties of Umno president, said the party’s survival now lies on the “undivided and strong support” of its members. “At this rate, the future and survival of our race are at a critical state. Therefore, Umno must be restructured to ensure it remains relevant as a political organisation that can safeguard the Malays and Malaysians as a whole. “Let us leave behind all the political nostalgia and improve ourselves to ensure our political survival. “We must think and conduct self-evaluation to find out our weaknesses. The “rehabilitation” process must be carried out at all level; from top to bottom, as well as at the branch and division levels. “I believe that everything happens for a reason; for us to be better and rise up again,” he said in a press conference with Umno-Online that was published on it’s website. Also present was Umno deputy president Datuk Seri Hishammuddin Hussein. Zahid later asked Umno members at all levels to continue giving their support not just to him and Hishammuddin, but also other leadership at state, division and branch levels. He also called on members to make “adjustment” as the party is now an opposition. “For that, we have to be a constructive opposition. Our failure this time will lead to another success, if we practise istiqamah and will work harder for it. “Every branch is obliged to be more open and wise in managing different views of the members, who want fresh change. “Let us face the reality and rise again together,” he said. Meanwhile, Zahid said as BN is the only party that has 78 members of parliament, every action from now on will be made as a group. “InsyaAllah (God willing), every action will be taken as a group. We will not allow BN MPs to be teared apart one by one. “Any negotiation and discussion will be made in groups. As we are all aware, Umno and BN have been in power longer at the Federal level. “We are at a very difficult phase and our political journey is still far away, but we must remember that this is not the end”. The UMNO Vice President and now acting on the President’s role and former Deputy Prime Minister Dr Zahid also asked UMNO leaders and members to change their attitude. AHMAD ZAHID HAMIDI dan Hishammuddin Tun Hussein dalam sidang akhbar khas di Kuala Lumpur semalam. KUALA LUMPUR 19 Mei – Ahli-ahli UMNO perlu mengubah sikap masing-masing bagi menghadapi fasa getir ketika ini demi kelangsungan dan perjuangan parti. Naib Presiden UMNO yang menjalankan tugas-tugas Presiden parti, Datuk Seri Dr. Ahmad Zahid Hamidi berkata, atas sebab itu kepemimpinan di semua peringkat parti perlu disusun semula bagi membolehkan UMNO tetap relevan. Katanya, usaha itu perlu dilakukan untuk memastikan UMNO sebagai parti politik yang masih berupaya memayungi orang Melayu dan rakyat keseluruhannya. “Kita perlu muhasabah dengan memperbaiki segala kelemahan dan kekurangan parti selama ini, justeru proses pemulihan mesti bermula daripada peringkat atas sehingga akar umbi. “Kelangsungan politik UMNO hari ini berpaksikan kepada sokongan padu ahli pelbagai peringkat dan keyakinan sepenuhnya terhadap kepemimpinan parti,” lapor UMNO Online, yang memetik Ahmad Zahid dalam sidang akhbar khas di sini, hari ini. Yang turut hadir, Naib Presiden UMNO yang menjalankan Tugas-tugas Timbalan Presiden parti, Datuk Seri Hishammuddin Tun Hussein. Terdahulu, kedua-dua pemimpin berkenaan mengadakan perjumpaan tertutup bersama Badan Perhubungan UMNO Melaka dan Pulau Pinang di Pusat Dagangan Dunia Putra (PWTC), di sini. Jelas Ahmad Zahid yang juga Ahli Parlimen Bagan Datuk, setiap ketua cawangan wajib berlapang dada dan bijak menguruskan pandangan yang berbeza daripada ahli yang kini mahukan pembaharuan yang segar. Kata beliau, ahli-ahli UMNO pula perlu memainkan peranan sebagai pembangkang yang konstruktif dan efektif di setiap negeri selain berusaha menghapuskan ‘political liability’. “Saya minta ahli-ahli UMNO di semua peringkat memberi sokongan kepada kepimpinan parti dan yakinlah bahawa apa yang berlaku ini pasti ada hikmahnya,” katanya. However. as expected the blaming game commences. UMNO Youth Chief Khairy Jamaluddin. PETALING JAYA: Umno’s biggest mistake in the run-up to the 14th General Election was its failure to acknowledge that the grassroots had rejected the party, said its Youth chief Khairy Jamaluddin. “What happened was we became delusional; we got drunk on our own Kool-Aid and we got carried away. “We didn’t want to bell the cat. Nobody, after former deputy Tan Sri Muhyiddin Yassin was purged, after Datuk Seri Shafie was purged … Nobody wanted to acknowledge we had a problem. That was a terrible mistake on our part,” he told Channel News Asia yesterday. Khairy said he wished he had told then-prime minister Datuk Seri Najib Abdul Abdul Razak what it meant after he dropped Muhyiddin and Shafie from his Cabinet after both publicly criticised him over 1MDB. He said the mistake of failing to speak the truth in order to protect Najib is one he will personally have to live with for the rest of his life. “Was there a signal? Yes, there were clear signals but we became oblivious to the signals,” Khairy said. “This must not happen again, we must not ever allow Umno leaders to be detached from reality and not ask tough questions. If we continue with our feudal mindset of protecting the leader from the truth, Umno will go extinct,” he said. Khairy said the loss was a collective responsibility while at the same time blaming Najib’s leadership for BN’s disastrous showing. He said both BN and Umno need to accept that they have been systemically rejected by the people. He said when BN lost its two-thirds majority in 2008, the then-prime minister Tun Abdullah Ahmad Badawi was replaced by Najib but the party did not change operationally. The Umno Youth chief said Umno thought that by changing the head everything will sort itself out. “We cannot make the same mistake again,” Khairy said. He pointed out it was not just rejection of Najib, but also the rejection of Umno and BN. “It was a systemic rejection of what we stand for and if we can accept that, then we can start to rebuild this party,” he added. Khairy said there were four things Umno and BN would have to do in the next year or two in order to offer itself as a “credible alternative” to the PH government within five years. He said for starters, Umno and BN need to make sure the numbers are preserved. Secondly, he said Umno needs to defend itself against any attempts from the PH government to de-register the party for failing to hold its party elections. He said thirdly, BN needs to learn to be a strong and credible opposition in Parliament by providing checks and balances. Khairy said finally, the party needs to work on structural changes to reflect the changing aspirations of the people. He said it was time for Umno to re-look its structure, including the possibility of opening its membership to all Malaysians regardless of race or religion. “We should seriously consider all options. What model do we want? United Malays National Organisation or United Malaysian National Organisation? What is our DNA, what is our reason d’être? “These questions need to be asked; we should not be fixed in what model we take. Everything is on the table,” Khairy said. That statement surely is not reflective of the right attitude to portray for the benefit and inspiration of the UMNO and BN youth, if not Malaysians as a whole. The immediate former UMNO President and Prime Minister Dato’ Seri Mohd. Najib Tun Razak was quick to respond for Khairy’s banter against him over media. PETALING JAYA: Former prime minister Datuk Seri Najib Tun Razak said Khairy Jamaluddin and other Barisan Nasional leaders should have spoken up earlier if they had a problem with his leadership. “As far as I’m concerned, I’ve always practised an open leadership style,” Najib told the Malay Mail. “People were free to voice their comments, even differences of opinion. I’m quite open about it, except that I wanted it to be done in private, because we should not attack each other as members of the government,” added Najib. The Pekan MP said that Khairy was free to voice his dissatisfaction or concern to him. “Khairy was free to come and see me. Then I could then decide, whether to accept or not to accept.He didn’t do that. I mean, he admitted that he didn’t do that,” he said. Khairy had earlier told Channel News Asia that Umno had been decimated during the general elections because it had become so detached from reality and thought it was invincible. Khairy said that Umno members were “delusional” and “drunk on our own Kool-Aid”. He also admitted that he regretted not telling Najib that the grassroots had rejected them. Najib did not mention names, but seemed to indirectly allude to former Umno deputy president Tan Sri Muhyiddin Yassin and former Umno vice-president Datuk Seri Shafie Apdal, who were both punished after they had spoken out in public against Najib’s handling of the 1Malaysia Development Berhad (1MDB) controversy. “He (Khairy) should realise that I’m not going to dictate against anyone with difference of opinion. I only want party discipline, and those who were disciplined by the party, it was because they broke party discipline,” he said. Najib told the portal that he never forced his ideals on any Barisan members. “If you attack the leadership openly, that’s against party discipline. “But if you come and say: ‘Sir, I disagree with you. I think you should do it this way.’ That is not against party discipline,” he said. Najib has since resigned as president of Umno and chairman of BN. His duties have been taken over by his former deputy, Datuk Seri Ahmad Zahid Hamidi. It is rather childish for UMNO Youth Chief Khairy to air his comment on BN’s failure to retain its position as the Federal Government and most of the State Governments through media in that manner. As if it would make Malaysians, especially the youth have more faith in BN from now on. Amongst thinking youth, that would probably create more doubts on supposed BN’s future steward, for his ability to stand up and tell the truth when it matters. The Malays have a saying for such, ‘Rumah siap, pahat pun berbunyi’. It translate to ‘When the house is ready, that is when the pounding on the wall begins’. Khairy as a political opportunist, is shining brighter with such theatrical statement. As the UMNO and BN Youth Chief, Khairy should prove his mettle now and start working the ground instead of making statements through the media. UMNO Youth should realise that the past five years at the helm of UMNO Youth Movement, Khairy did not do much, especially working through the youth organisations and student movements. That is the reality that they have to face and overcome and ‘Biting the Bullet’ should start yesterday! Former Prime Minister Najib in his first explanation on UMNO and BN’s worst performance since the past thirteen GE, said he was a victim of slander and lies. PEKAN: Former prime minister Datuk Seri Najib Tun Razak (pic) said he did not steal from the people and is now the victim of political attacks in order to weaken Umno. “I’m not a person who steals what belongs to the people,” said Najib when addressing members of the Pekan Umno branch during a meeting he officiated on Sunday (May 20). “The people of Pekan knows I did not steal. For 42 years I have served the people here. “Now I am targeted because I was a Prime Minister and the leader of the political party. 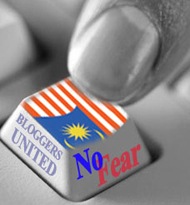 So if my brand is weakened, then Umno’s name will also be weakened. This is a political strategy,” he added. Najib added that he would continue to support the fight for Umno’s case, even though Barisan Nasional no longer controls Putrajaya. “I readily accept the defeat with an open heart but now we must continue to fight for the people and we must show the people that we are sincere,” said Najib who stepped down as Umno president last week. It was the Pekan MP’s first visit to his constituency after successfully defending his seat during GE14 but which also saw Barisan lose the simple majority in Parliament. The fact is that all allegations against Former UMNO President Najib has yet to be proven. Another important fact is that raison d’être, Malaysians voted for of drama, slander and lies. Khairy is his capacity as the UMNO and BN Youth Chief, did not work against both although he and the movements under his command had almost three years of ample time and space to do it. At large, neither UMNO and BN led Government policies nor implementation failed the nation and the rakyat, the past 70 years. Another paramount fact that since assuming the office as the Sixth Prime Minister nine years ago, Najib tried to bridge the gap between Semenanjung and Sabah and Sarawak and introduced serious programs for the economic and development of the rural Malaysians in the two states. Some serious bullet biting got to be done here, for the future of younger Malaysians and Malaysia. So many are elated upon the results of recently concluded XIV GE and dubbed the dawn of a ‘New Malaysia’ when the Opposition Coalition topple the ruling Barisan Nasional of 69 years. However, the dawn of this so called ‘New Malaysia’ isn’t that promising when a ninety three years old former Prime Minister Tun Dr. Mahathir Mohamad had sworn in as the Seventh Prime Minister on Friday 11 May 2018. For starters, it takes almost ten days to announce a full Cabinet. Even that is without the Foreign Minister. KUALA LUMPUR: Malaysian Prime Minister Mahathir Mohamad on Friday (May 18) unveiled his list of 14 Cabinet ministers to be sworn in next week, after the King approved the selection of names following a meeting at the palace. The swearing-in ceremony will be held on Monday at 11.30am at the Istana Negara. Since his election win, Dr Mahathir has announced five Cabinet ministers, including Lim Guan Eng as finance minister, Muhyiddin Yassin as home affairs minister and Mohammad Sabu as defence minister . Earlier on Friday, Dr Mahathir withdrew himself as education minister to honour a pledge in the coalition manifesto. The portfolio will now be taken by former university lecturer Dr Maszlee Malik. A foreign minister was not named. In a statement, he named PKR deputy president Mohamed Azmin Ali as the minister of economic affairs and DAP deputy chairman Gobind Singh Deo as the minister of communications and multimedia. He also appointed PKR Wanita chief Zuraida Kamaruddin as the housing and local government minister; DAP national organising secretary Anthony Loke Siew Fook as the minister of transport and DAP vice-chairman Kulasegaran Murugeson as the minister of human resource. The others named on Friday include Amanah deputy president Salahuddin Ayub, as the minister of agriculture and agro-based industry; Amanah strategic director Dr Dzulkefly Ahmad, as the minister of health; and Titiwangsa MP Rina Harun of Bersatu, as the minister of rural development. Mohamed Azmin said that he found out about the appointment after he was informed by Selangor State Secretary Mohd Amin Ahmad Ahya, and that he intends to meet Dr Mahathir as soon as possible to get further clarification on his appointment as minister of economic affairs. “I thank Tun Dr Mahathir for his faith in me leading such a senior ministry. The responsibility is very big as the work is to revive the national economy,” Mohamed Azmin told reporters after an event to break fast. “However, I have informed the Sultan of Selangor about this and have told him that I also informed him that I will be meeting the prime minister soon, maybe tonight or at the latest tomorrow, to get further clarification on the scope of duties entrusted to me,” he said. These are appointments as per Article 43 of the Federal Constitution. However, instead a Council of Eminent Persons was announced seven days ago and already started working and calling persons in respective authoritaty position to appear before them. At the moment, Prime Minister Dr Mahathir is legally and effectively a one-man Government. Earlier, the Prime Minister pronounced that he would be Minister of Education. Then, he ‘Flip-Flop’ped because their own promises stated they weren’t supposed to do that. Did he forget or completely oblivious of their own promises? Also, he announced the recently sworn in Menteri Besar Selangor would be sworn in as the Minister of Economic Affairs at 1130hrs on Monday. Perhaps he too should be the Malaysian Ambassador to Indonesia, since the job is now a political appointee. Then the nominated Minister of Finance who is supposed to swear in before His Majesty on Monday too, is also supposed to appear in Pulau Pinang criminal High Court before Madam Justice Hadhariah Syed Ismail for an ongoing graft trial. GEORGE TOWN: The corruption trial of Lim Guan Eng is set to continue on May 21 after being postponed due to GE14. The former Penang Chief Minister’s lead counsel, Gobind Singh Deo, said the case would be brought up for mention in the High Court. Lim pleaded not guilty on June 30, 2016, to two counts of corruption over the conversion of agricultural land to residential status and purchase of a plot and bungalow at below market value. He was charged with using his position as Chief Minister to gain gratification for himself and wife Betty Chew Gek Cheng by approving the application for conversion of agricultural land to a public housing zone in Balik Pulau to a company, Magnificent Emblem Sdn Bhd. Lim faces a second charge of using his position to obtain a plot of land and bungalow at No. 25, Jalan Pinhorn, on July 28, 2015, from businesswoman Phang Li Koon for RM2.8mil, at below market value. Phang pleaded not guilty to a charge of abetting him. The trial was delayed after both filed motions to declare Section 62 of the Malaysian Anti-Corruption Commission Act as unconstitutional. Justice Hadhariah Syed Ismail dismissed the applications and the defendants referred the matter to the Court of Appeal, which ruled that Section 62 was unconstitutional. The Federal Court later overturned the ruling. By that note, the nominated Minister of Communications and Multimedia, who is too supposed to appear before His Majesty for the swearing in, is expected to appear before the High Court judge defending his client. Ah yes! The nominated Minister of Finance is an ex-convict and His Majesty’s Treasury at the moment is without an effective Chief Secretary since the immediate past was sent away to Public Services Department. Let is also take note all matters pertaining tax at the moment seems to be decided by four men and a lady, in a forum called Council of Eminent Persons, which is completely absent from being mentioned anywhere in the said Acts in the name of His Majesty, passed by His Majesty’s Parliament. Sounds like Medieval Malaysia, brought forward, isn’t it? Corporate giant Tony “Flip-and-Fake” Fernandes may be in hot water for his air claims that amongst other things, he was forced by Malaysian Aviation Commission (MAVCOM) to cancel additional flights for the recently concluded XIV GE. PETALING JAYA: The Malaysian Aviation Commission (Mavcom) has lodged a police report against Tan Sri Tony Fernandes over claims that it had instructed AirAsia to cancel all 120 additional flights the airline had scheduled before GE14. Calling Fernandes’ accusations “baseless and malicious”, it also denied the AirAsia Group CEO’s claims that Mavcom had summoned AirAsia. According to Mavcom, on April 13 and 18, AirAsia had via the Civil Aviation Authority of Malaysia applied for a total of 54 additional flights (27 return journeys with a maximum volume of 13,660 passengers) to be operated during the GE14 period, which Mavcom approved on April 17 and April 18 respectively. At 3.20pm on April 20, the airline requested for an additional 86 flights (43 return journeys with a maximum volume of 15,480 passengers). However on April 23 morning, AirAsia sent Mavcom a revised flight application for 66 additional flights (33 return journeys with maximum volume of 12,274 passengers) for the period of May 6 to 13 with a note to disregard its earlier applications. Mavcom said it had approved all 66 additional flights that AirAsia applied for by April 23. It added that on April 19 and April 20, Mavcom executive chairman Tan Sri Abdullah Ahmad sought clarification from all airlines if there was sufficient demand for the additional flights requested. “Only AirAsia proceeded to reduce its application for extra flights while Firefly, Malaysia Airlines and Malindo Air maintained their requests,” it said. “Mavcom further reiterates that it had not issued any directive to any airline to reduce or cancel any flights. “Inclusive of AirAsia, Mavcom approved additional flight applications of the various Malaysian-based airlines as of 24 April 2018, totalling 166 flights (83 return journeys with a maximum volume of 26,434 passengers),” it added. Mavcom said it is mandated under the Malaysian Aviation Commission Act 2015 to act as an independent regulator for economic and commercial matters related to civil aviation in Malaysia. On Fernandes’ statement that “within 24 hours, we were summoned by the Malaysian Aviation Commission”, Mavcom refutes that any AirAsia staff members were summoned between April 17 and May 13 to appear before the Commission regarding the matter. After receiving brickbats over AirAsia’s endorsement for Barisan Nasional, Fernandes released a video on Sunday (May 13) apologising for “buckling under the pressure”. He said the low-cost carrier added 120 extra flights, which would have carried 26,000 people on top of normal flights and reduced ticket prices. Unfortunately, he said, this put him under even more pressure when the government realised that the airline was ferrying so many voters. “Within 24 hours, we were summoned by the Malaysian Aviation Commission (Mavcom) and told to cancel all those flights,” he claimed. The AirAsia Group co-founder Fernandes was very quick to “Flip and Fake” with a lame story how he was co-erced into coming up with several items in his attempt campaigning for Barisan Nasional (BN). An AirAsia X A330-300 livery carried the BN Blue and the air stewardess even wore blue instead of the infamous AirAsia red dress. It takes an effort to change an aircraft livery and specially ordered blue uniforms for the cabin crew. By that score, it is unbelievable that Fernandes did all that “under pressure”! Fernandes also said the the Malaysia commercial aviation industry does not require MAVCOM to made the industry progress and lambasted the aviation authority. AirAsia chief says transport ministry is capable of fulfilling role that Mavcom is playing now. BANGKOK: The transport ministry is more than capable of helping the local airline industry grow, without the need for the Malaysian Aviation Commission (Mavcom), AirAsia Group chief executive officer Tony Fernandes said today. “But I think it’s better to not have Mavcom,” he told Malaysian reporters at the airline’s #HalfABillion Guests Flown Celebration here today. Fernandes was responding to questions on the police report lodged by Mavcom today over his claim that the aviation regulatory body told AirAsia to cancel all additional 120 flights it requested during the 14th general election. The AirAsia head said dealing with Mavcom was difficult and resulted in AirAsia deputy group CEO (digital, transformation, corporate services) Aireen Omar, AirAsia Malaysia CEO Riad Asmat and AirAsia X Malaysia CEO Benyamin Ismail facing difficult situations. “Airene, myself, Ben and Riad had nothing short of torture when dealing with Mavcom. “AirAsia and I will never stop fighting for fair industry practices and demand decisions to be made for the benefit of all Malaysians,” he said. Shortly after Mavcom said it lodged the report, AirAsia issued a statement saying it has evidence and facts to back Fernandes’ allegations. “We would like to emphasise that the video released by Fernandes on Sunday, May 13, 2018 is fully supported by evidence and facts, including direct communication between Riad and Mavcom executive chairman Abdullah Ahmad. “We will divulge the evidence and facts to the appropriate authorities, at the right time,” the airline said. It is good that Fernandes is consistent for being a ‘Drama King’ and conveniently and unjustly blame others, especially authorities and GLCs for his own shortcomings and/or whenever he and his ideas hit a brickwall. It is that consistent that any utterance of words from his mouth carry little credibility and his integrity as a corporate leader is full of inconsistencies, manipulation and probably, lies too. Malaysian youths got a goodie never been given before when Prime Minister Dato’ Sri Mohd. Najib Tun Razak announced tax free income for everyone under the age twenty six, beginning the financial year 2017. “This include those who have paid income tax”. 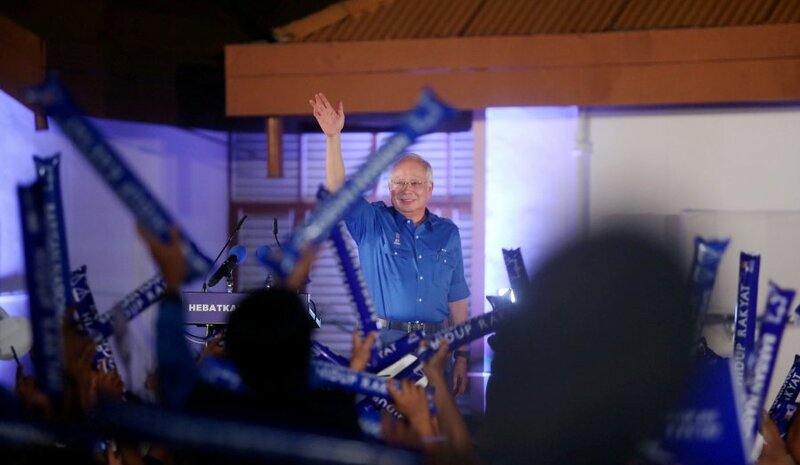 Prime Minister Datuk Seri Najib Razak tonight announced three pieces of ‘good news’ for the people if the Barisan Nasional (BN) government is given a fresh mandate in the 14th General Election. NSTP Pic by OSMAN ADNAN. PEKAN: Prime Minister Datuk Seri Najib Razak tonight announced three pieces of ‘good news’ for the people if the Barisan Nasional (BN) government is given a fresh mandate in the 14th General Election. In a 30-minute speech, delivered at 10pm amid a backdrop of the humble, two-room wooden house in Pekan built by his father, the late Tun Abdul Razak, Najib addressed a 4,000-strong crowd, some of whom had gathered as early as 7pm. To a roar of approval from the crowd, the prime minister announced that if BN is given a new mandate, youths aged 26 and below would be fully exempted from paying income tax. “I understand that the youths need money for their expenses such as buying a car, paying their house rent as well as to give money to their parents. As a government that cares, this marks the first time that this is being done,” he said. Najib said the income tax exemption, he said, would apply to the 2017 assessment year. Those who had paid their taxes last year, he added, would receive a full reimbursement. As for the second piece of good news, Najib announced that a special two-day public holiday would be declared if BN wins the election. The holidays, he said, would fall on May 14 and 15, which are a Monday and Tuesday. For states whose weekends fall on a Friday and Saturday, the special public holidays would fall on a Sunday and Monday. “This would give time for Malaysians to spend time with their families as well as make their Hari Raya Aidilfitri celebrations,” he said. His third piece of good news, which drew loud cheers, was on the exemption of toll charges for five days of the Hari Raya holidays. Najib said all highways would be toll-free two days before Aidilfitri to enable the people to return to their hometowns, as well as on the first three days of Aidilfitri. Najib said these pledges, as well as those made in the BN election manifesto, were proof that the opposition’s claims that Malaysia was a failed or bankrupt nation is untrue. “A bankrupt or failed nation as claimed by the opposition cannot promise all this. We do not need saving, we are a successful nation,” he said. He also recorded his appreciation to Deputy Prime Minister Datuk Seri Dr Ahmad Zahid Hamidi, other BN leaders and members at all levels for their dedication to BN’s struggle. He said in the months leading up to the election, he went down to the ground to meet the people and understand their needs and wants. “This gave me the opportunity to meet the people. All the hands I clasped, each face I saw, all these moments hold a special place in my heart,” he said. Najib said that apart from being a leader and prime minister, he is also only human. I have feelings and emotions. I’ve been insulted, ridiculed, slandered but I see it as God’s test and what I have to endure. But when I see the faces of the people I’ve met, who told me to not give up, these wounds and scars disappear. “It is these moments also which strengthened my resolve to continue and fight,” he said. “I, Najib Razak, on behalf of BN candidates, humbly ask for voters to without a doubt in their hearts, choose BN, a party which is proven and always keeps its promises. “For 60 years, we have led this country and effected change after change. If given a new mandate, we will make Malaysia even greater,” he said. This means that wage earners whose had a net salary after the deduction of income tax at source, would get refunds. In the history of the Inland Revenue Board, this is the first time an age group had been totally absolved from to the duty for the coffers of His Majesty’s Treasury. Prime Minister Najib also announced a complete toll free of the highway system for five days, to commemorate this years Hari Raya Aidil Fitri. These three goodies are on top of the 264 other offered when Prime Minister Najib as the BN Chairman unveiled the ruling coalition manifesto. Johor shall remain progressively and productively strong under Barisan Nasional (BN) as the voters decide tomorrow, amidst the many speculation the coalition party led by UMNO would get a massive hit and falter. Menteri Besar Johor Dato’ Seri Khaled Nordin is optimistic that Johoreans shall decide to remain steady on course and for future to come, with the right strategy planned and a broad follow through and implementation already in good progress. “MB Khaled promised delivered what he promised five years ago. His ratings for delivery and implementation have actually gone up”. Our observation find that generally Johoreans are not bothered by over politicking, especially at national level. Probably, it is because they have experienced the ‘Chinese Tsunami’ and BN already saw its worst performance in Johor GE. One BN Division Chief who is defending his State Assembly seat said “We have 17,000 Chinese voters (in the Parliamentary constituency). If we can get only 4,000 votes from them, we are home free”. During a walkabout in a pasar malam of a kampung off Parit Jawa, Muar MP and BN Division Chief Dato’ Razali Ibrahim is well liked by the folks, be it amongst the Malays, Chinese and Indians. Razali whose home is in Seri Menanti, which is almost bordering Batu Pahat, has a well staffed service centre in Muar town. “In a recent event of 1MDB CEO Arul Kanda’s roadshow on the lies and negative perception about the (business problem manipulated into a political scandal) the strategic investment firm, MCA managed to fill half the hall in UMNO building. And they asked questions!”. PPBM Youth Chief Syed Saddiq Syed Abdul Rahman, who is hardly in Muar even in this XIV GE is attempting to wrest the traditional UMNO constituency from Razali. Ledang BN Chief Dato’ Ir. Hamim Samuri also is at ease, when talked to about his Parliamentary constituency said “I have a service centre here in Tangkak. However, I don’t wait for (people to come with) problems. I go after problems!”. Hamim speaks with a notable Muarian twang, is also well received by his constituents. He was observed at the only Friday prayer in this XIV GE in a Sengkang, near Bukit Gambir. He was the amongst the last to leave. PPBM President Tan Sri Muhyiddin Yassin is attempting to wrest the State Assembly seat, on top defending his Pagoh Parliamentary seat. “He never served this constituency. It is unlikely they would vote him”. Another observation worth considering about Johor is that the Opposition coalition, especially PPBM and PAN is very thin on grassroots election machinery. “These Malay political hopefuls cannot even find a candidate’s polling agent for the PDMs (polling centres). You do realise, in an election especially a GE, you are in trouble if your machine is weak”. Johor had been a traditional BN stronghold as UMNO was born in the state 72 years ago, this Friday. “I predict status quo for BN Johor, if not better results”, said an astute observer. “The three corner fights would spread the Opposition resources thin”. He also added “Muhyiddin was UMNO Deputy President and been at the helm of Pagoh UMNO Division since 1983 (then Muar-Pagoh). How was Pagoh UMNO affected with Muhyiddin’s sacking?”. He is right. Muhyiddin’s unceremonious departure did not hurt Pagoh UMNO three years ago. If PAS never did well in Johor, how could PAN dent the traditional Malay seats. “PKR is nowhere, especially when they have no PAS machinery to depend on. The fate of Opposition politics in Johor is only left to DAP”. In the last GE, the former MB Johor Tan Sri Abdul Ghani Othman said then “If only 15% of the Chinese voted BN, Johor is Opposition free”. Ghani, now Chairman of Sime Darby Plantations goes around quietly in Ledang and Pagoh to do his bid for this campaign. Johor UMNO is known for the service to the Bangsa Johor. It is this track record is the basis of the optimism, not withstanding the polling centres analysis based on UMNO branches intel and head count. A good example is this is the BN Seri Gading Parliamentary candidate Dato’ Aziz Kaprawi. He not only served the constituency which is in the out skirts of Batu Pahat town where 42% of the voters are Chinese, Aziz and previous Seri Gading brought so much development into this once a back water Java-nese centric kampung. Aziz as the Deputy Minister of Transport got the High Spreed Railway (HSR) between Kuala Lumpur and Singapore stops at Pura Kencana, a village next to Parti Raja. “An election is a game of numbers. If you had worked your constituency, you should know how your party stand”. Political intel stated the high turn out at Opposition coalition is due massive ‘Groupie-Effect’. “It is generally the same people moving around. Where can you get a high Chinese turn put at Opposition coalition rallies, especially in Malay majority areas?’, opined a true blue Johorean. AirAsia founder and CEO Tan Srì Tony Fernandes strongly sends a message to vote Barisan Nasional (BN) at this XIV GE. He urged Malaysians to continue vote and support the BN Government. “The Government and Prime Minister Najib put the country first”. It is very comforting to see Charted Accountant turned media executive and now corporate giant Fernandes committing himself and assets of the firm towards the campaign of BN. On the other hand, Chairman of AirAsia X Tan Srì Rafidah Aziz is hard on the campaign trail for the Opposition coalition. The former BN Wanita Chief was sacked from UMNO two days ago. KUALA LUMPUR (May 5): Former Minister of International Trade and Industry Tan Sri Rafidah Aziz is amused over news that she has been sacked by Umno’s disciplinary board for speaking at opposition Pakatan Harapan’s events. Rafidah, who made her debut appearance on the opposition’s stage in Melaka on Friday night amid thunderous applause from the crowd, asked how can Umno sack a person who is no longer a member of its party since about a decade ago. The former Wanita Umno chief told theedgemarkets.com that she does not want to be a member of an organisation that does not even abide by its own constitution and is “existing without legal foundation and standing”. “I read with sheer amusement on the ‘Public Announcement’ that I have been “sacked” by UMNO. What ‘sacking’? I have ceased being a member of UMNO since almost a decade ago. I have never attended any cawangan meeting for years! No one can ‘sack’ a non-member! “UMNO is sadly NO LONGER now the ‘United Malays National Organisation’ I was inducted into in the 1960’s. The very spirit, culture and embodiment of TODAY’S UMNO has strayed so far off-TANGENT from the original UMNO before this present cohort of so-called leaders. It seems now to be all about PERSONAL LOYALTY, a materialistic culture, often driven by GREED for power and personal enrichment, and NOT about serving the people and nation. “Humility, Good Manners and Mutual Respect has been replaced by ARROGANCE. UMNO MUST reform and go back to basics if it were to remain relevant in the ever changing environment. UMNO is NOTHING without its original spirit. “One does NOT have to be a card-carrying member of ANY political party to serve. After almost half a century of being a member, I can NO LONGER identify with the UMNO of today. The VALUE SYSTEM has been eroded. Principles no longer seem to matter. UMNO does NOT even ABIDE by its OWN Constitution and is existing without legal foundation and standing. Rafidah then went on to share a video of Umno president Datuk Seri Najib Razak that was taken in 2015, when he announced that the party’s supreme council has decided to postpone the party’s election that was due to be held in October 2016, by 18 months. In the video, Najib also said the postponement could not be more than 18 months from the original due date, according to the party’s constitution. It was reported earlier today that Umno secretary-general Datuk Seri Tengku Adnan Tengku Mansor confirmed that he had signed letters to expel Rafidah, together with former Finance MinisterTun Daim Zainuddin, for their outright support of Pakatan Rakyat, while another former minister Tan Sri Rais Yatim has been placed under investigation for disciplinary issues . “I was at the Umno headquarters yesterday (May 4) and signed the letters to withdraw their membership,” he was quoted as saying. “According to the party’s constitution, they as Umno veterans should know their actions were wrong when they give ceramah on the opposition’s stage,” Tengku Adnan reportedly told reporters in Putrajaya. Daim, meanwhile, has expressed relief that he was sacked from Umno, saying he had no business being in an “illegal society”. Another chartered accountant turned corporate leader turned Minister of Economic Planning and now Chairman of the largest unit trust investment firm Tan Srì Abdul Wahid Omar also came out in his effort to support Federal Government’s commitment It initiative for the economy. Assalamualaikum wbt dan salam sejahtera rakan-rakan sekalian. 1. Alhamdulillah dua hari lagi pada hari Rabu 9 Mei ini, kita rakyat Malaysia bakal menjalankan tanggungjawab untuk mengundi dalam Pilihanraya Umum ke14. Ramai rakan-rakan yang tidak sabar untuk keluar mengundi setelah sekian lama berkempen dan ‘dikempen’. Bagi kita yang bukan ahli politik pun terasa penat. Bayangkan apa perasaan ahli-ahli politik yang terlibat secara langsung dalam PRU14 ini. 2. Kita menghargai mereka yang secara sukarela mengenengahkan diri untuk bertanding dan berkhidmat kepada rakyat. Tidak kira sama ada menang atau kalah, kedua-duanya memerlukan pengorbanan tenaga, wang dan masa keluarga. Sekiranya menang, sebahagian daripada mereka berpeluang memegang jawatan dalam pentadbiran yang pendapatannya mungkin tidak setimpal dengan tanggungjawab berat yang dipikul. Sekiranya mereka kalah, lagilah berat kerana mungkin terpinggir dari kancah politik negara sekarang-kurangnya selama 5 tahun. i) GST 6% ini menggantikan cukai jualan 10% & cukai perkhidmatan 6%. Ia bukan cukai tambahan. ii) Kadar 6% yang dikenakan adalah yang terendah di ASEAN dan antara yang terendah di dunia. 160 negara telah melaksanakan GST atau Value Added Tax (VAT). Sebagai contoh, kadar di Singapura 7%, Thailand 7%, Indonesia 10%, Vietnam 10%, Filipina 12%. Di Australia 10% dan di UK jauh lebih tinggi iaitu 20% . iii) Untuk mengurangkan kesan kenaikan harga barang kepada rakyat, Kerajaan telah memperluaskan senarai barangan asas yang dikenakan kadar sifar atau terkecuali dari GST. Ini termasuk barangan makanan asas seperti beras, gula, minyak masak, ayam, daging, ikan & sebagainya, ubat-ubatan, buku-buku dan minyak petrol RON95 & Diesel. iv) Semasa pelaksanaan GST diumumkan dalam Bajet 2014 pada 25 Oktober 2013, Kerajaan juga telah mengumumkan langkah ‘pengimbangan’ atau offset measures seperti pengurangan cukai pendapatan individu antara 1-3%, pengurangan cukai pendapatan korporat dari 25% kepada 24% dan pengurangan cukai perusahaan kecil & sederhana dari 20% kepada 19%. Pemberian BR1M isirumah berpendapatan RM3,000 kebawah sebulan juga ditingkatkan dari RM500 ke RM650 manakala isirumah berpendapatan RM3,000-4,000 sebulan mula diberikan BR1M RM450 buat pertama kali. Seterusnya dalam Bajet 2015, jumlah BR1M telah dinaikkan masing-masing kepada kepada RM950 & RM750 . Untuk individu bujang berpendapatan RM2,000 kebawah pula, BR1M dinaikkan kepada RM350. Ini semua bertujuan untuk meringankan impak kenaikan harga barang. v) Tujuan asal pelaksanaan GST adalah untuk memperluaskan asas percukaian negara memandangkan kita hanya ada 2 juta pembayar cukai pendapatan, satu jumlah yang kecil berbanding jumlah rakyat Malaysia seramai 30 juta. GST adalah cukai penggunaan (consumption or indirect tax) dimana mereka yang berbelanja lebih adalah dari kalangan mereka yang berpendapatan lebih. Ini juga selaras dengan langkah konsolidasi fiskal yang mensasarkan bajet seimbang dalam jangkamasa pertengahan. Dengan peningkatan pendapatan Kerajaan, kita bukan sahaja dapat mengurangkan defisit fiskal kita malah dapat melaksanakan banyak projek pembangunan yang tertangguh sebelum ini seperti pembinaan lebuhraya, jalanraya, jambatan, sekolah, hospital, klinik desa, dll. Ini termasuklah pembinaan lebuhraya Pan Borneo yang sedang rancak pembinaannya dan dijangka siap pada tahun 2022. 4. Terdapat cadangan untuk menghapuskan GST dan berbalik kepada sistem percukaian lama iaitu SST. Bagi saya ini suatu langkah yang ke belakang atau ‘regressive’ dan boleh membahayakan ekonomi. Ini kerana kutipan GST pada tahun 2017 adalah sebanyak RM42 bilion dan dijangka meningkat kepada RM44 billion tahun ini berbanding kutipan SST RM17 billion pada tahun 2014. Sekiranya GST dimansuhkan, terdapat kekurangan pendapatan sebanyak RM27 bilion (2% daripada KDNK). 5. Sekiranya Ini berlaku, Kerajaan ada 3 pilihan. Pertama – Menaikkan cukai pendapatan atau memperkenalkan cukai baru seperti cukai keuntungan modal (Capital Gains Tax). Kedua – Mengurangkan perbelanjaan termasuk perbelanjaan pembangunan. Ini bermakna membatalkan atau menangguhkan projek-projek pembangunan yang telah diluluskan sebelum ini; atau Ketiga – Meningkatkan defisit fiskal kepada 5%. Kesemua opsyen tersebut amat berbahaya kerana boleh menjejaskan pasaran modal dan mengakibatkan penarafan kredit hutang antarabangsa negara kita diturunkan daripada paras A3/A- kepada BBB. Ini sudah tentu akan meningkatkan kos pinjaman dan memudaratkan ekonomi negara. 6. Saya berharap sistem GST akan dikekalkan. Perhatian boleh diberikan kepada memperbaiki lagi pelaksanaan program dan projek-projek yang dapat memberikan lebih peluang perniagaan dan pekerjaan kepada rakyat dan mempertingkatkan kesejahteraan rakyat. Ini selaras dengan matlamat model baru ekonomi yang mensasarkan Malaysia menjadi sebuah negara maju yang inklusif dan mampan. i) Keluar mengundi seawal mungkin kerana ini adalah hak kita sebagai warganegara Malaysia. ii) Jangan membenarkan pendapat politik memecah-belahkan atau mengasingkan keluarga. Silaturrahim perlu dikekalkan. iii) Menerima keputusan dengan hati terbuka, merapatkan saf dan bersatu membangunkan negara. 8. Marilah kita bersama-sama memainkan peranan masing-masing, bersikap membina dan menghayati/ mengamalkan prinsip Rukun Negara iaitu Kepercayaan kepada Tuhan, Kesetiaan kepada Raja dan Negara, Keluhuran Perlembagaan, Kedaulatan Undangan-undang dan Kesopanan dan Kesusilaan. Selamat mengundi & Salam hormat. It is a brief but substantial explanation about the Goods and Services Tax (GST), which has been blamed as one of the culprit for the rising cost of living. Wahid’s message also reminded that the unity amongst Malaysians in all units should not be at the expense of politics and the practice of democracy. These two corporate barons based their projections on the best returns on their investments. Like wise, they urge to vote BN under the leadership of Prime Minister Dato’ Sri Mohd. Najib Tun Razak for the best outcome in context of going concern, policies, it’s implementation and follow through, track record and strategic results.